It’s rare to have a Western with a female lead, particularly in the 1950s. Joan Crawford’s Vienna is hardly just eye candy either. She owns the screen with a look and refuses to tread in the confines of her civilization. For that reason, Vienna is a threat to everyone in the local town. Accepting her claim to valuable real estate near the railroad makes Vienna an equal to the guys, and perhaps even superior to them. It’s a clever shift in gender dynamics, though Johnny Guitar doesn’t completely bypass those norms. The title reminds us that men still try to remain front and center. The love story must drive the plot, even if it’s the least interesting part of the story. Sterling Hayden plays the title character, who exists mostly to protect Vienna from the blood-thirsty townspeople. In a similar fashion to Steve Trevor (Chris Pine) in this year’s Wonder Woman, Guitar (whose real name is Johnny Logan) clearly plays second fiddle to the main character. He’s a past love that once lived a life of crime, but now his attention is all on Vienna. There’s an odd conflict between romance and self-determination in Vienna’s heart, and that fight exists within the film’s themes. Crawford’s Vienna is so focused that she hardly blinks, but then she falls into Logan’s arms multiple times. The script from Ben Maddow indicts McCarthyism yet can’t help but give the characters something beyond the ideological fight. The standout among the forces of civilization is Emma Small (Mercedes McCambridge), who hates Vienna with all of her being. She’s jealous of Vienna’s relationship with “The Dancin’ Kid” (Scott Brady), who’s hardly a kid and doesn’t dance. Brady was 30 when Johnny Guitar was released and looks even older. McCambridge and Crawford reportedly did not get along on the set, and that hatred emanates from the screen. It’s easy to believe that the characters want to kill each other, particularly Small. The look on McCambridge’s face when she burns down Vienna’s place is chilling. It’s a vision of evil from a villain technically on the side of the law. Ward Bond’s John McIvers may believe he’s running the show, but it’s Small that’s driving the furor against Vienna and the Dancin’ Kid’s gang. It’s the crowd mentality that drives the push to not only drive them from the town, but to hang them. The dark middle act reveals how far bloodlust can take even normal people. It’s only after the first killing that it subsides, at least for most of them. It’s easy to draw parallels between the falsehoods that drive this mission and the evils of McCarthyism. Maddow had to use Phillip Yordan’s name on the script due to his past issues with the House Un-American Activities Committee. The final showdown is the only place where Johnny Guitar slips a bit. The shootout has power yet seems too conventional given the earlier scenes. It does include a quick stop that reminds me of the brief cease fire during Children of Men. Bond’s haunted face shows how quickly a quest for justice can get out of control. On the other hand, the last shot indicates that the love story is the driving narrative. That feels like an over-simplification given what we’ve witnessed up to that point. Vienna has lost her home and livelihood, but at least she has love. This moment ends the story on a hollow note; we root for Vienna but not in this way. 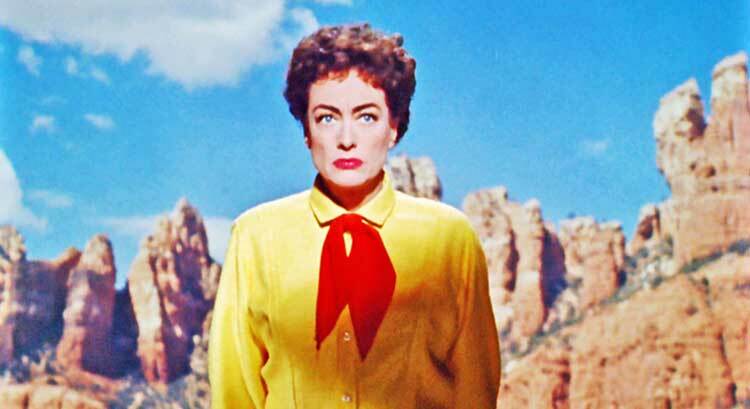 It’s easy to view Johnny Guitar as a revisionist western, but there are still parts that are genre norms. Its primary conflict is between the forces of civilization and the wilderness, order and freedom. Vienna wants the chance to go her own way, but the crowd wants to stop her because she’s an outsider. Her bright red lipstick and colorful outfits aren’t the typical garb for a woman in the “civilized” world. Crawford’s intensity sells the idea that Vienna is a singular individual that won’t cater to any societal norms. She falls for gunslingers and refuses to indict them for the behavior. It’s an entertaining twist on the conventional structure, though the end result doesn’t completely upend the typical narrative. Johnny Guitar is currently streaming on Amazon Prime. Other than the gender switch, this felt like a pretty standard, trope-filled Western to me. I was disappointed with Sterling Hayden as well--this was a role that felt like it could have been filled with anyone capable of drawing a gun quickly and riding a horse. I definitely agree about Hayden, who sleep walks through most of the movie. He plays the title character yet seems a little lost. That's why the ending felt strange to me. It sells the idea that it's a love story that I didn't see. I did enjoy the movie overall, though. Nice review! I really enjoy this film, it's such a pleasure to just look at. I haven't seen In a Lonely Place, but given that it's your top Ray, I need to track it down ASAP. Alex, I'd definitely suggest that you check out In a Lonely Place. Bogart's performance is something to see. It's up there with his best work. I have some catching up to do, only watched Rebel of your top 5. Heard great things about the other four. Makes a change to have a female lead in a western. The Furies (1950) w/Barbara Stanwyck is another on my watchlist. I've yet to see The Furies, but it's hard to go wrong with Stanwyck. I still have a lot more to see from Ray, and I'd definitely suggest that you check out In a Lonely Place in particular.